My hair regimen has always been very simple. When went natural it was to cut back the amount of time that I spent on styling my hair and of course to be free of the harsh relaxers. 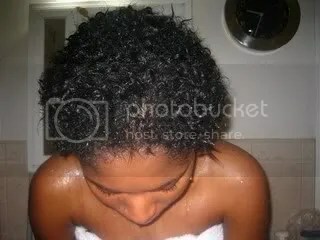 When I first did the Big Chop, I would cowash every morning. That went on for about 2 years until my hair become too long for cowashing every day (of course wet shoulders in the winter time wasn’t fun). Like many new naturals I faced issues with dryness, single strand knots, and being style challenged didn’t help make the situation any better. Now, more than 4 years after I big chopped I can say that I’m at a good place in my hair journey. My hair is healthy and long. I’m still style “challenged” but I can get away with since I can do some pretty neat buns. Part hair into 4 sections then flat iron (I use 1″ sections). what is your updated picture today??? I see a pic on LHCF and I wanted to know if you are HL now??? I know this response is super late but I’m actually not hip length. I’ve been taking off a few inches every few months. 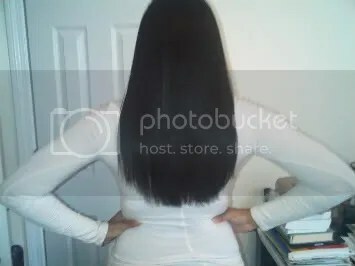 I’m thinking about maintaining at mid-back or waist length at the longest. Will you do a hair update with pictures soon? You are one of my hair inspirations!!! I may do one soon. I’ve cutting my hair a lot lately so it’s pretty much at the same length. Good! Trying to regrow my hair to your length now after horrible hairdressers ruined mine.. Looking good!